From chocolate to wine, if it goes in your mouth and helps your skin, you'll find it here. You may have heard that red wine is better for you than white, ever wonder why? I mean, both are made from grapes, and grapes are fruit so...? Red wine, like green tea and chocolate, is rich in polyphenol, a type of antioxidant. In grapes, the skin and seeds have the highest concentration of antioxidants. As far as health benefits are concerned, the longer the skin is kept on the grape the better! Red wine, as opposed to white wine or even grape juice, is fermented with the dark skins and seeds. So what does all this mean for your skin? Polyphenols protect skin from UV light and help keep it elastic. Studies have even shown that people who drink red wine have fewer cancerous skin lesions. 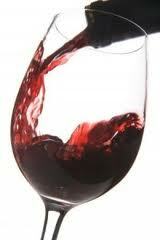 Red wine also increases blood flow to the heart and other organs like the skin, boosting it's oxygen supply. In addition to skin benefits, red wine has been shown to reduce cholesterol and lower your risk for coronary heart disease, so that's good! Remember though, the health benefits of wine are based on women drinking one 5oz glass a day, two glasses for men. Drinking more doesn't up the benefits, it actually negates them, so drink in moderation please!